Before I start this post I need to say that many vegans do not eat brand name Marmite because it is owned by Unilever, who test on animals. There are other yeast extracts available and a popular one in the UK is Essential Yeast Extract. I do currently buy Marmite and eat a lot of it but I have very good intentions to switch when my current jar is finished. Having said all that, I do love Marmite. It is a perfect salty savoury tasty spread which can liven up so many dishes. It is full of Umami, which is an idea I did not understand until I began thinking of how to describe Marmite many years to the Russian family I lived with. It’s also full of B vitamins so if I ever needed an excuse to stuff my face that’s a good one. I carry small heart shaped pots of Marmite with me at all times so that if i’m ever stuck anywhere with only a bread roll that I can eat, I can liven it up with my favourite spread. The most common use for Marmite is thinly spread on toast on top of vegan margarine. I also love to sneak a peanut butter layer on top for a delicious mix of savoury and salty. 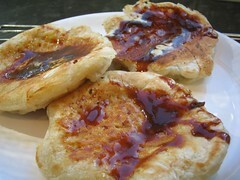 but it can go on anything toasted – English muffins with marmite are gorgeous, or my own particular favourite – crumpets. I made these for VeganMofo 2 years ago but to be honest I usually buy them. You can also use it to add depth to stews, soups and casseroles. I love to add some to Veganomicon Cholent or any other savoury stew. You probably can’t taste the Marmite in the end result but it just gives the final dish an extra layer of flavour. I also cook a few dishes with Marmite when I want it to be the dominating flavour. These dishes are not for the faint hearted. our favourite, which I’ve been making for over 20 years (and still haven’t written down! ), is my Broccoli and Marmite Pie . This was a very early blog post for me when my pictures were even worse and I used to harp on about football all the time. Despite my promises I still haven’t exactly documented how I make it. Bianca did a better job of measuring than I did, but I promise that next time I make it I’ll be scientific about it. I also recently made a great Marmite gravy for Carla’s next book, which was perfect on mashed potatoes. 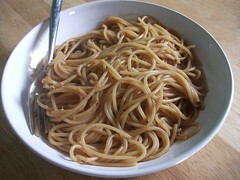 My most recent test of Marmite came via Nigella and her “Spaghetti with Marmite“, which she’d taken from someone else. (Tut Tut BBC, making that age old mistake of calling a recipe vegetarian when we all know that Parmesan can never be vegetarian). I used Vitalite margarine and a shaking of Nutritional yeast instead of the parmesan. I’ll never dislike anything that tastes mostly of Marmite but I couldn’t rave over this the way Nigella did. If I’m going to eat a carb plus Marmite I think I’ll stick with toast or crumpets. I too am a huge fan of yeast extracts and use it any time I want a ‘beefy’ flavour, whether in gravies, gluten roasts, pies, or whatever else I’m craving. It’s also pretty good on roast spuds. I felt as if my liking of marmite was my true entrance into British life. Shame I still can’t stomach the tea everyone drinks! I started using Natex a few months ago and I really like it too, so maybe try that if you’re looking for an alternative? I’ve never had marmite but you made me want to try it! I bought a small container of marmite for a recipe, and then had no idea what to do with the rest. Thanks for the ideas! I am a marmite-addict, and actually read this post while eating an English muffin with marmite and PB. Can’t wait to try your pie! I am a Marmite addict as well, can’t wait to try the pie! I had no idea that marmite was owned by unilever! That’s disappointing. Love the looks of that broccoli marmite pie! Marmite! I love that stuff. I tried Vegemite once but never Marmite. I didn’t care for the flavor of Vegemite. Any chance that I’d like Marmite or are they pretty much the same? I really thought I would enjoy it, because I like strong flavors. Everyone always says that you have to grow up on it to like it; do you think that’s true? I didn’t try it until I went to University, so you can definitely come to it later in life. We love your marmite broccoli pie! I have made it many, many times. I don’t think you really need exact measurements. It’s always worked for me. I’m trying to stop buying the name-brand stuff to. The ASDA’s own brand is just as good!